Cleveland, OH -- With less than one month to go before Rocket Mortgage FieldHouse opens its doors again for the start of the 2018-19 Cleveland Cavaliers, Monsters, concert and event season, work continues at a feverish pace. As it enters its 25th year of operation, the publicly-owned arena is being transformed into a state-of-the-art facility that will allow it to compete for years to come. 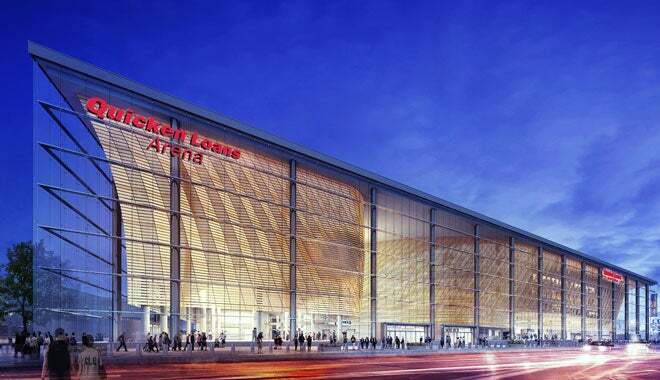 The continuing project also has resulted in the extension of the Cavaliers lease at The Q, committing to the arena for at least 40 years since its original lease, which is among the longest facility tenures in pro sports history. Crews are making significant progress on both the exterior and interior renovations of the building, which will include the completion of several interior spaces by the time Rocket Mortgage FieldHouse re-opens this October. The project will be completed in October 2019. Rocket Mortgage FieldHouse Transformation, made possible by a public/private partnership formed between the City of Cleveland, Cuyahoga County and the Cleveland Cavaliers, will modernize the publicly-owned venue and allow it to compete for and attract high-profile events, improve the guest experience, and ensure that it positively impacts for the City of Cleveland, Cuyahoga County, the community and neighborhoods, and the region for the long-term future. It will also extend the Cavs lease all the way to 2034 – putting the Cavs in Rocket Mortgage FieldHouse for at least 40 years total since they moved into the building in 1994, one of the longest terms in the NBA. Dan Gilbert and the Cavs organization are committing an additional $45 million of private funding towards additional updates and improvements to The Q. This raises the team’s current private funding commitment to over $115 million, while the Transformation project’s total investment scope now grows to $185 million. The original $140 million investment for the project was a 50/50 split with the Cavaliers committed to paying $70 million, plus covering any cost overruns. The Cavaliers’ portion of the funding will cover all non-public, club, suite, team, premium space, AV/LED, lighting and multi-media upgrades, as well as a significant portion of the public space updates, which includes concourse improvements and square footage increases. The existing $70 million capped, public portion of funding will be repaid almost entirely from direct, arena event-related revenue sources and is being used to complete the remaining portion of the public space re-design, as well as the associated square footage increases. The revenue sources are primarily comprised of the existing Admissions Tax on tickets sold for events at The Q. Continuing with Gilbert-related entities exemplary record of minority workforce inclusion such as the construction of the casinos in Cleveland and Cincinnati, the Cavaliers are proud to report that Rocket Mortgage FieldHouse Transformation minority business and workforce inclusion is exceeding the project goals pursuant to the City of Cleveland’s Community Benefits Agreement (CBA), endorsed by the County, and adopted in resolution by Gateway Economic Development Corp. As of July 2018, 19% of the companies contracted by the Cavs to work on the renovation are considered minority-owned and 23% of the companies are woman-owned, exceeding the project’s goal of 15% and 7%, respectively. In addition, 36% of the project’s workforce is considered diverse, exceeding the project’s goal of 16%. To date, the most visible work has been the demolition of the exterior north side of the arena (along Huron Rd from Ontario St. to E. 6th Street) to make way for the new glass façade and atrium that will add 42,530 square feet of new public space to The Q. The foundation that will support the atrium has been laid and giant steel columns that form the perimeter of the glass wall are currently being installed. The glass installation will begin at the northeast corner soon and will be ongoing throughout the year. Work on the south side of the arena has expanded the building’s footprint out toward Gateway Plaza and will add 6,350 square feet to The Q. This additional square footage will increase the space to provide a more fan-friendly entryway into the arena and create a larger concourse area that will significantly improve wayfinding and pedestrian flow. It will also make way for a newly created neighborhood that will include new food and beverage options on the arena’s south side. While work will continue on the concourse renovation throughout the season, the new south entry on Gateway Plaza will be completed for the arena’s re-opening in October. The new hospitality area located in Loudville presented by FirstEnergy, located at the south end of The Q’s upper level, will feature new seating and standing room views of the court, as well as a central bar for fans to gather. All fans will be welcome to enjoy this new Loudville space that will be open during all Cavs home games, as well as most other arena events beginning in the 2019-20 season. To make room to build this exciting area, the seats and concrete risers in sections 216, 217 and 218 have been removed. Fans and guests will notice that this area will be blocked off for the entire 2018-19 season as work continues. Uninterrupted Concourse on Huntington Bank Club Level (fourth level) - Work has been completed that opens a continuous concourse on the fourth level of the arena. In the original arena design, the Huntington Bank Club Level was interrupted by a private hospitality area which did not allow for fans to walk the total perimeter of the concourse. The new “Westfield Club” has been designed to create a more efficient and free-flowing concourse on the fourth level. Concourse Floors - The original flooring throughout the main and upper level concourses is in the process of being replaced. The upper level flooring will be nearly completed for the start of the upcoming 2018-19 season, while the existing surface on the main concourse has been removed and covered with temporary paint. This will be a work in progress throughout the season. When Rocket Mortgage FieldHouse re-opens in October, the arena will feature two new membership hospitality areas, as well as three existing clubs that have been updated with reconfigured layouts, modern finishes and furnishings, and the latest technology. All feature all-inclusive food and beverage service for members and their guests. Access to these hospitality spaces will be exclusive to those with a Foundation Membership, the new premium membership club of the Cleveland Cavaliers. This new customized platform will also provide members with enhanced access to year-round members-only events, exclusive experiences, amenities and more. These enhanced membership spaces will also provide the all-important hospitality amenities that are critical in competing for and attracting national and international events the magnitude of the Republican National Convention hosted at Rocket Mortgage FieldHouse in 2016, a future NBA All-Star Game, NCAA Championships and more. These spaces and amenities have been carefully updated and designed in relation to fan-based user feedback the Cavaliers have received and been able to incorporate into the renovation and build out of the existing and new areas. Chairman’s Club (formerly the Lexus Lounge), is located on the north side of the event level off the four-bank elevators. Courtside Club (formerly the Court Club), located on the south end and “back-of-house” on the event level is the largest of all the club areas. Bacardi Ocho Signature Lounge makes its debut for the Cavaliers 2018-19 season. This area provides a behind-the-scenes view to the player’s locker room hallway and tunnel. The Westfield Champions Club (formerly the VIP Club), located on the south side, will feature club box and lounge seating for all Cavaliers games. Huntington Legends Club, located on the north side of Level 4, is an all new hospitality area that overlooks the arena bowl with great views for all Cavs games and Rocket Mortgage FieldHouse events. In addition, the suites located on the Huntington Bank Club Level (4) and everstream Founder’s Level (2) will have a fresh look, all updated with new seating, finishes, décor and technology. (L-R) Cavs player Larry Nance Jr., Cavs GM Koby Altman, Cavs player Kevin Love and Sr. Director of Basketball Operations Brock Aller tour construction of the new locker room. The Cavaliers locker room is also undergoing a total redesign and reconfiguration that will be ready for the tipoff of the 2018-19 season. The locker room redesign and renovation is also being privately funded by Cavaliers ownership as part of the additional $45 million commitment. Rocket Mortgage FieldHouse will close again for the summer of 2019 to complete Rocket Mortgage FieldHouse Transformation for the start of the Cavaliers 2019-20 season. Rocket Mortgage FieldHouse Transformation is a major renovation project to update nearly 24-year-old Rocket Mortgage FieldHouse, home to the NBA Cleveland Cavaliers, AHL Cleveland Monsters and over 200 ticketed events annually. The publicly-owned arena, located in the Gateway District in downtown Cleveland, is operated by the Cavaliers organization. The project is a partnership between City of Cleveland, Cuyahoga County and the Cavaliers that will modernize the venue to maintain its world-class status, enhance the fan experience, and continue to provide a positive impact for the city of Cleveland, the community and neighborhoods and the region over the long-term. Rocket Mortgage FieldHouse Transformation will extend the Cavs lease through 2034 and will bring an NBA All-Star Week to Cleveland. The transformation of Rocket Mortgage FieldHouse will be completed for the start of the Cavaliers 2019-2020 NBA season. To learn more and view renderings go to TheQTransformation.com.